I’ll admit it: I was nervous. Although my quest to read the world has taken me on many adventures and seen me speaking to a wide variety of audiences – from 20 Women’s Institute members in a school hall in Lee to 300 Procter & Gamble employees in Geneva – I had never faced a challenge quite like this. As I walked into the authors’ yurt, backstage at the Edinburgh International Book Festival, I couldn’t help being aware that I was here to take part in one of the most renowned literary events in the world. Now, I’ve been in a yurt or two before (I once gave a talk in one in Canterbury), but I have never seen one to compare to this. Sprawling over an area about twice the size of my flat, it was made up of a series of conjoined octagons, which created pleasing little alcoves furnished with benches and cushions, where you could sit and prepare before your event. There was a luggage area, and tea and coffee, and an array of tempting snacks, and everywhere you looked you spied well-known, bookish faces, as though the world’s literary supplements had come to life and deposited their occupants here. Then, after a brief pre-talk chat with chair Rosemary Burnett, Gaston and I made our way to the Baillie Gifford Corner Theatre, where our event, ‘The World in Words’, was due to begin. I’d had an anxiety dream the night before that no-one came to watch us, but when we walked out on stage I was delighted to see that the room was full. Gaston kicked off proceedings by reading from his witty and fascinating book, Lingo: A Language Spotter’s Guide to Europe, I read a bit from Reading the World, and the discussion quickly got going, helped along by Rosemary’s questions. Afterwards, we went to the bookshop to sign copies and chat to members of the audience. I was particularly pleased to meet several people I have been in touch with virtually over the past few years, among them Catharine Cellier-Smart, a blogger who lives on Reunion Island, where she is one of only two ‘sworn translators’, who help local people by translating official documents. A brief respite and then it was back onstage, this time with award-winning translator, poet and critic, Michael Hofmann. Hofmann’s criticism is renowned (indeed, he was described in the festival programme as ‘one of the most fearlessly outspoken literary critics writing in English today’), so I was more than a little in awe of him. He was very gracious and kind, however, and went out of his way to put me at my ease. Our discussion, chaired by Society of Authors chair Daniel Hahn (another award-winning translator), explored the concept of world literature, and some of the many challenges and joys translators and readers experience when trying to access stories from other linguistic and literary cultures. I spent the following day recharging and seeing a handful of the more than 3,000 shows being staged at the Edinburgh Festival Fringe this month (among them In His Own Write, a groundbreaking performance of the Beatle John Lennon’s nonsense book). But on Wednesday I was back at the literary festival, this time as an audience member. Queuing for a talk on ‘What is the Nation State, Anyway?’ by academics Frank Bechhofer & David McCrone, I was delighted to bump into Gaston Dorren. We sat together to watch the event, which turned out to be an intriguing examination of Bechhofer and McCrone’s research into attitudes to national identity in England and Scotland. According to the pair, it’s helpful to think of national identity as a set of cards (made up of markers such as birthplace, language, place of residence and ethnicity), which each person will play differently from situation to situation. I found this very interesting as working out what makes a book count as being ‘from’ a particular nation was one of the big questions I had to grapple with during my year of reading the world. Afterwards, Gaston and I repaired to the authors’ yurt where we spent a happy hour discussing writing, languages and our next book projects. I was also pleased to have a chance to say hello to my former creative writing tutor, Paul Magrs, who was preparing to run a readers’ workshop on Mary Shelley’s Frankenstein. The final event of my visit was ‘Where I’m Writing From’, a discussion between authors Petina Gappah and Nell Zink about national identity and writing. As a Zimbabwean living in Geneva and an American living in Germany respectively, Gappah and Zink had a lot to say on the topic and there were plenty of laughs along the way. I was particularly struck by Gappah’s comments on the danger of expecting a writer to speak for a nation because, as she said, ‘writing about is not the same as writing for’ a place or a group of people. And I was thrilled to hear about her collaborative project to translate George Orwell’s Animal Farm into Shona – the first time the novel has ever been published in an indigenous African language. When the applause died down, it was time to head off to the station to catch the train back to King’s Cross. My Edinburgh adventure had lasted three days and involved a round trip of more than 800 miles. Yet I felt I had travelled much further than that. 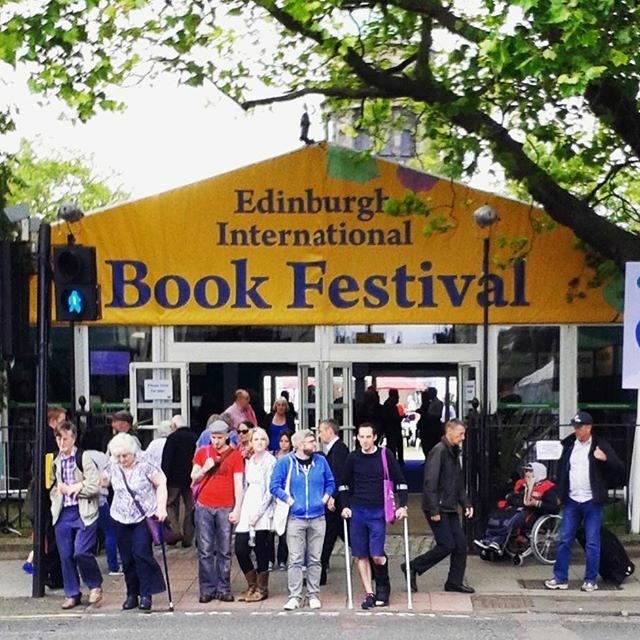 I’ve just returned from a five-day visit to the Edinburgh Book Festival. Worth a report, of course – except that in the meantime other things have piled up, all clamouring for my time. So I’m happy to find that Ann Morgan (of Reading the World fame and the nicest stage-mate I could have wished for) has managed to look back at the festival, including the several things that we attended together. Here then are her experiences, quite a few of which are similar to my own. So sad I missed your talk. I didn’t realise you were speaking until I saw your book in the bookshop on Wednesday. Hopefully you will be back next year! Yes, I think it’s been a particularly good one (if I do say so myself). Maybe next year? Sounds like an excellent and productive time! Pleased to say Petina Grappah is ‘one of ours’ (i.e. a member of the Geneva Writers’ Group) and that I’ll have the opportunity to see and hear her in action soon at a literary festival in Morges this coming weekend. But someday, I do hope to make it to Edinburgh too! Oh jolly good. Yes, of course – I should have made that connection! She’s a wonderful speaker. I’m sure you’ll enjoy seeing her at Morges. Sounds like a great visit! Glad there were people at your talk 🙂 I love Edinburgh.